Brazil is rebuilding itself. In preparation for the FIFA World Cup and the Olympic Games, Brazil's host cities are undergoing numerous changes through extensive construction projects. These include massive infrastructural upgrades, construction of new stadiums, and the restructuring of inner city areas to obtain brand new building grounds. Civil society organizations estimate that up to 250,000 persons are directly affected by governmental evictions and resettlements, while official figures remain unknown. A wide variety of internationally valid agreements contain housing rights. 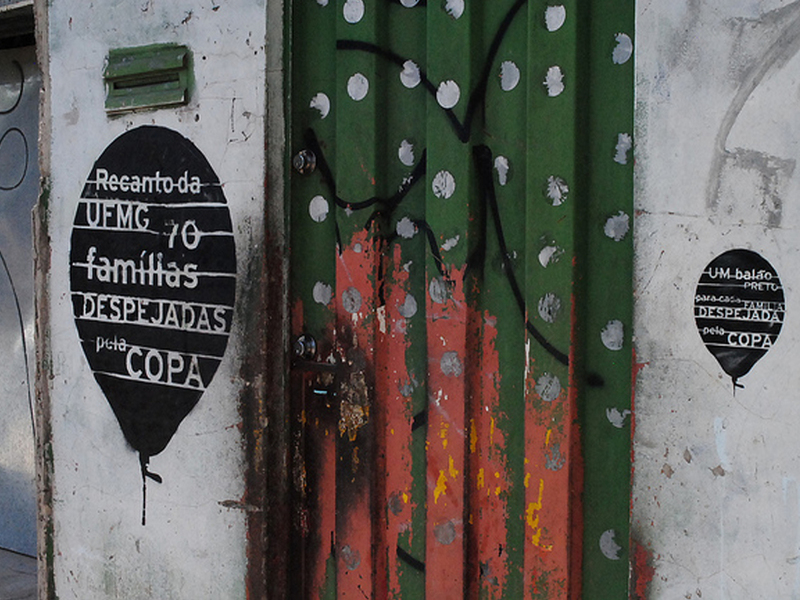 Those most likely to apply to the current evictions and resettlements in Brazil are: the Convention on the Rights of the Child; the Convention on the Elimination of All Forms of Discrimination against Women; the Charter of the Organization of American States; and, in particular, the UN Covenant on Economic, Social and Cultural Rights (ICESCR). This Covenant is to be considered the most notable legal form of international protection against forced evictions. The crucial question of whether governmental acts are legal resettlements or unlawful forced evictions can be answered by this multilateral treaty, as not every intervention can be considered a violation of the standards set by humanitarian international law. The Covenant, adopted by a United Nations General Assembly resolution in 1966, entered into force on January 3, 1976. It has binding force for state parties. Brazil joined the Covenant on January 24, 1992. The ICESCR commits its state parties to work toward ensuring economic, social, and cultural rights for individuals. The "right to adequate housing" can be derived from Article 11.1 of the Covenant. It states that everyone has the right to a standard of living that is adequate for their health, well-being, and family, including food, clothing, housing, medical care, and necessary social services, and the right to security in the event of unemployment, sickness, disability, and other circumstances beyond their control. The parties mutually obligate themselves to respect and protect their people's right to housing. Its content goes far beyond legal protection against weather and environmental condition. In exemplary commentary, the UN provides authoritative clarity about the scope of the covenant (ICESCR/GC4). Apart from minimal requirements for habitability, the committee's general comment on the right to adequate housing particularly emphasizes the infrastructural conditions in the immediate vicinity of the residence. This includes the availability of social services and infrastructure; easy access to health and education facilities; accessibility to the former workplace; as well as the cultural adequacy of the neighborhood. If evictions are inevitable due to environmental risk factors, notice must be given at least three months in advance at the very latest to all affected persons. By making information available in a reasonable time frame, the threatened people are given the possibility to actively participate in the process of change. Absolute transparency is needed in order to provide the possibility to appeal. Furthermore, adequate alternatives have to be offered in accordance with the infrastructural terms and conditions as well as adequate financial compensation (CESCR/GC7). Article 11.1 of ICESCR also indicates that public resettlement programs should improve living conditions wherever possible – in any case, living conditions must not be worsened. Moreover, there are set procedures regarding the eviction process that are determined by the committee. Evictions shall not take place in bad weather or at night. Moreover, the presence of government officials, as well as a proper identification of all persons carrying out the eviction, is absolutely necessary. If resettlement practices do not meet the required conditions, either fully or partially, the eviction is to be considered illegal under international law. Brazilian authorities only superficially complied with the agreed humanitarian duties. In fact, Brazil infringed on a variety of the mentioned UN articles. It disrespected the right to adequate housing, as stated in Article 11.1 of the ICESCR. More specifically, the right to information and consultation; the right to adequate compensation; the right to adequate resettlement options; and, particularly important, the interrelated right of work have all been violated, among other topics. With regard to this, the majority of Brazil's resettlement actions to prepare for the mega-events must be considered human rights violations and need to be called "forced evictions." The burden for the new structures around Brazil's costly stadiums is mainly carried by the habitants of Brazil's poorest neighborhoods, the favelas. The vast majority of the evictions took place in areas without clear land tenure security, as possession of the grounds on which the settlements have been constructed is not clearly attributable. Nevertheless, this occurs despite what is stated in Brazil's constitution, which assigns possession of occupied land to people who have lived there for more than five years. The overwhelming majority of the cases are characterized by a lack of transparent and timely information as well as the lack of adequate compensation payments. Public authorities exerted intense pressure on the habitants to accept resettlement and inappropriate compensation. In this procedure, authorities particularly exploited the fact that habitants generally had little or no formal education and were insufficiently informed of their rights. The resettlement locations are up to 60 km from the former communities. The majority have to move to social housing projects ("minha casa, minha vida") in the outermost periphery of the city. Far from the urban centers, the families are not sufficiently linked to public transport systems, people have to travel several hours to their former workplaces, and the areas have a tremendous lack of public health and educational facilities of quality.